Hearing Rostam perform at the Appel Room for Lincoln Center's American Songbook series on January 31st, it was obvious how pivotal the man was in crafting the strings on Vampire Weekend's records. While Vampire Weekend fans have a lot to look forward to in 2018, the band's first new album in six years (Father of the Bride) is on the horizon and the group will be touring later this year. But they may be disappointed to find that one of the founding members has parted ways with the group. Rostam Batmanglij left the group in 2016 to work on other projects including producing tracks for Maggie Rogers, Haim, and Frank Ocean, and finishing up (and releasing) his debut solo record Half-Light in 2017. 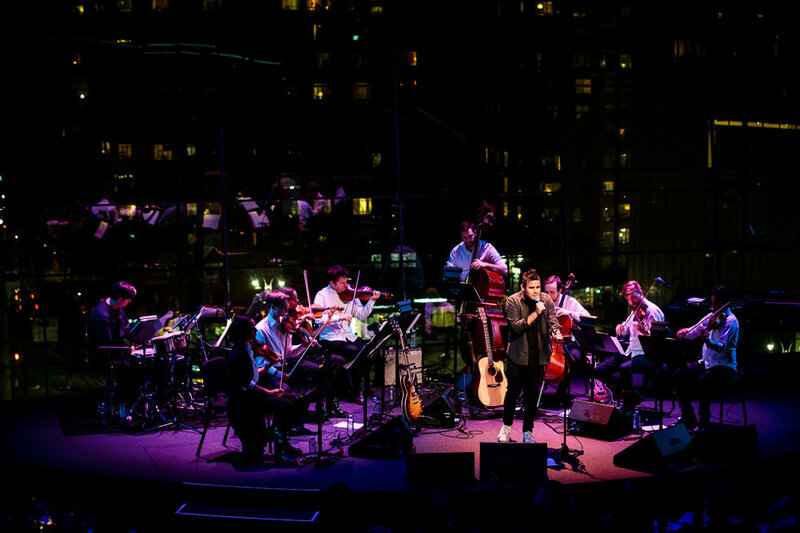 Hearing Rostam perform at the Appel Room for Lincoln Center's American Songbook series on January 31st, it was obvious how pivotal the man was in crafting the strings on Vampire Weekend's records. He was accompanied by an orchestral octet that provided lush strings for his work while Jeff Curtain played percussion. Rostam opened strongly with songs from Half Light but had to pause part way through as the cello wasn't plugged into the mix. Following "Thatch Snow", the group performed the "big hits", "Wood" (the most Vampire Weekend sounding track of the lot) and the blissed-out "Bike Dream". Other highlights of the night included a new instrumental piece that Rostam had on the back burner for years but finished for this performance. The first part of it ebbed and flowed like the traffic passing below in Columbus Circle (it would have been cool if he somehow synced traffic to it) before the band opened up more. Of course, Rostam performed an early song of his, "Campus", (released by Vampire Weekend), not once but twice because he didn't think the band was tight enough the first time around (they were tauter the second time). Later, he shared a story about how he bought a mandolin to incorporate into a song for Maggie Rogers. However, she vetoed it quick which led Rostam to play it on his catchy 2018 single, "In a River". He followed it up with an arrangement of Nick Drake's "Pink Moon" with an orchestral arrangement (unlike Drake's own). Rostam's performance was a charming showcase for his tunes and his personality. Upcoming shows at the Appel Room include the off-axis duo Nancy & Beth on February 13th, St. Vincent (long sold out) on Valentine's Day and the multitalented Gaby Moreno on the 27th.